17 years after its initial release, it’s hard to remember what an impact Robocop had. Many movies since then incorporated its cutting style, cynical humor and comic darkness and integration of different story-telling devices. These don’t seem quite as fresh now, but they still work really well for the movie. Note that this DVD presents an unrated cut of Robocop. This simply adds a few seconds of violence to the scene in which ED-209 malfunctions as well as the sequence in which the gang kills Murphy. Nothing substantial changes in these pieces, but the more graphic images alter their impact somewhat. 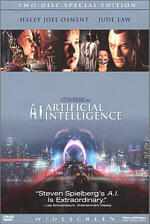 Robocop appears in an aspect ratio of approximately 1.66:1 on this single-sided, double-layered DVD; the image has not been enhanced for 16X9 televisions. That latter factor caused many of the picture’s problems, but the movie usually looked pretty good. Sharpness consistently appeared better than average. A few wider shots came across as slightly ill-defined, but those occurred infrequently. Instead, the movie mainly seemed concise and distinctive. While only a little edge enhancement popped up, the lack of anamorphic enhancement led to some fairly heavy instances of jagged edges and shimmering at times. Print flaws cropped up sporadically. I saw occasional instances of specks, marks, blotches and grit. These didn’t become overwhelming, but they seemed more prevalent than I’d like. While Robocop didn’t present a lively palette, the colors looked well rendered throughout the movie. The tones consistently came across as nicely vivid and vibrant, and they showed no flaws like runniness or smearing. The hues were deep and rich. Black levels also appeared firm and dark, and shadows were appropriately rendered without any excessive opacity. With anamorphic enhancement and a clean-up, this could have been a very good transfer, but as it stood, it fell to “B-“ territory. 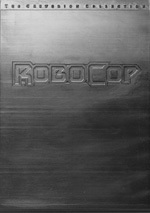 Back in the early Nineties, the audio of Robocop often earned plaudits as one of the top tracks available on laserdisc. That was a long time ago, and the Dolby Surround 2.0 audio no longer seems very exceptional. The soundfield appeared somewhat erratic. At times it presented a surprisingly vivid and lively sense of place, whereas other sequences felt much more limited and restricted. In general, though, the mix opened up the spectrum fairly well and gave us a reasonable amount of localized information. The rear speakers played a pretty active role during the action scenes, and consistently bolstered the forward spectrum. As with the soundfield, the quality of the audio appeared inconsistent. Speech came across as somewhat tinny at times, but the lines lacked edginess and remained easily intelligible. Music was a little subdued and occasionally got lost in the mix, but the score demonstrated adequate breadth and range. Effects varied. Sometimes they were very robust and dynamic, as some scenes offered lively elements with good pop. 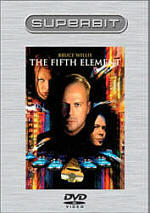 Other times the effects felt limp and flat, and a few action sequences lost punch due to weak execution. Bass response mostly fared well, as elements like ED-209 and explosions mainly presented nice oomph and power. Overall, the audio of Robocop was too erratic to earn more than a “B”, but it was still a fairly good piece for its age. When we check out the DVD’s extras, we start with an audio commentary from director Paul Verhoeven, producer Jon Davison, and writer Ed Neumeier. All of them sit separately for this edited compilation. The track provides a briskly paced and very informative affair. We get many good notes about the movie. 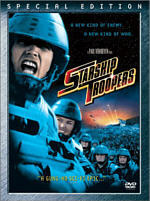 We hear about the travails finding both a director and a lead actor, various metaphors, themes and allusions, shooting in Dallas and the reasons for that choice, the origins of the story and Vietnam references, information about the effects and the Robosuit, the original ending, and plenty of other issues. The participants share space fairly equally and all add a great deal to the discussion. It’s a terrific and involving commentary. Footnote: although the DVD’s case claims that the commentary also involves Robocop expert Paul M. Sammon, that’s a mistake. Next we find a “multimedia presentation” called Shooting Robocop. Adapted from Paul M. Sammon’s essay in Cinefex magazine, it combines text with movie snippets and photos to illustrate points. The detailed production covers virtually all of the film’s visual elements; from the opening credit to the media breaks to locations to matte paintings to many other topics, we learn a lot about those areas. It’s a fine piece. In the Storyboards area, we find three subsections. “Film-to-Storyboard Comparison” gives us a look at the sequence in which we first meet ED-209 and lasts 83 seconds. More interesting are two unshot scenes. We see “Chase” and “Cemetery”. The former presents an action sequence that proved too expensive to shoot, and while the latter offers a dramatic piece in which Robocop visits Murphy’s grave. Finally, the DVD ends with both a teaser and a theatrical trailer. The package’s booklet seems weak by Criterion standards. It includes a very short and perfunctory essay from Carrie Rickey and that’s it. Audiences found a very pleasant surprise with Robocop in 1987, and the movie remains a winner. It combines cynical comedy with violent action and emotional depth to present a solid piece of work. The DVD presents erratic but generally fine picture with fairly good audio and a small package of extras highlighted by an excellent audio commentary. This DVD isn’t definitive, but it’s a nice package nonetheless.